[Ingredients]rou dou kui,bu gu zhi,wu wei zi,wu zhu yu,da zao. [Functions]Wen bu nuan pi,Se chang zhi xie.It is used for Diarrhea caused by Kidney yang deficiency. [Usage and Dosage] Take 9g per time, three times daily. 1. No wine and spicy,greasy food during taking this product. 6. If want to take it in a long run, please consult your doctor. 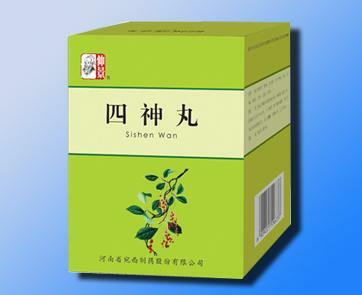 Sishenwan is strongly recommend for Diarrhea caused by Kinney yangxu.